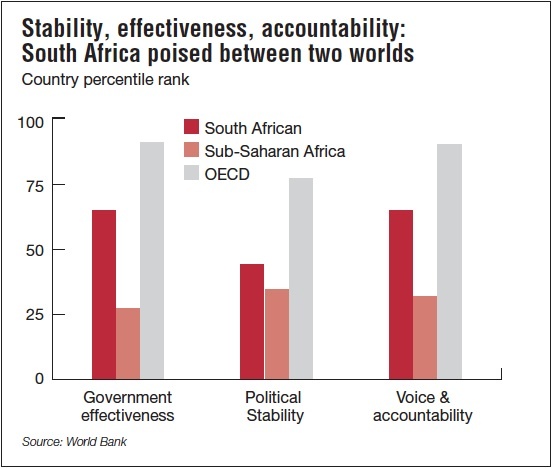 South Africa is squandering its opportunity to break the stereotype of failure and to be a great successful African nation. The ruling alliance has conceded, to an amorphous vacuum, the moral high ground that enabled it to dominate our country's polity, consequently a turbulent transition to a new phase is upon us. The nature and character of that transition will depend on the ability of the institutions of our democracy to withstand this most unprecedented test. The National Development Plan, the state's new fantastic roadmap designed to get the country back on track, might gather dust in the face of internal contestation both within government and the ruling alliance. Even the much talked-about infrastructure programme, aimed at stimulating the economy, is struggling to get off the ground as a result of the state's incompetence and other shortcomings. Governance is either dominated or captured by the forces of the "low dirt road" which have consequently placed our society in an invidious, unenviable and dangerous socio-political space. The "low dirt road" is characterised by a propensity to populist pander, empty promises, blatant corruption, an inclination to undermine the constitutional order and the rule of law, and a substitution of dialogue for intolerance and brute force. The performance scorecard of government is a litany of broken promises that have resulted in a credibility gap. At a time when the world was entering a recession, the masses were promised jobs, but as was to be expected employment declined. The dysfunctioning of our public education system, particularly in black communities, gained increased momentum. Only the dropping of the pass mark (to 30%) accounts for an increase in the number of those who pass matric, but many neither qualify for a place at tertiary education institutions nor employment. Although some crimes have reportedly dropped, organised crime and corruption have increased with a crippling effect on society. Although our HIV/AIDS programme has gained traction, quality public health system has deteriorated unabated. Rural development has been reduced to Nkandlaville. Poverty and inequalities are said to be the main challenge, yet self serving conduct has seen the political elite emerge as a privileged class while the lot of the poor worsens. The administrative capacity of the state has deteriorated due to favouritism, nepotism and the undue influence of political factionalism that has resulted in mindless cronyism. The state bureaucracy is cobbled by a rudderless and self serving political dictat. A powerful political and trade union associated clique calls the shots in a way that has undermined the confidence and authority of the leadership of the bureaucracy. This has been compounded by corruption that has seen an increased number of both politicians and public servants getting involved in business with both the state and private sector. Consequently, an incompetent state has emerged with destabilising effects on society. Predictably, a restive public has resorted to service delivery protests which soared to levels in 2012 unprecededted since the dawn of our democracy; as well as a labour relations mayhem at the heart of which is a fight against widening inequalities. There are signs of a deepening crisis of confidence in both the leadership of the country and government. We are likely to see more of these in the next few years as the country searches for alternatives. Disappointingly, the ANC government's reaction has been a systematic assault on hard-earned civil liberties including the media, free expression and assembly, militarisation of the police and their consequent less restrained use of lethal force – this resulted in 2011 in the death of Andries Tatane, in 2012 in the deaths of 34 mine workers and possibly many more in future. Shockingly for a human rights-based society that South Africa is, deaths in police hands, either during arrest or in custody, compares to those of the apartheid era. This has been accompanied by the muzzling of the institutions of the criminal justice system including the police, intelligence, prosecutions and various investigative units to be partisan. Unprecedented pressure is also being placed, so far unsuccessfully, on the judiciary to act similarly. Hence the proposed review of the decisions of the Constitutional Court and the Supreme Court of Appeal decisions. All this in order to create a ring of steel to insulate a powerful and corrupt political elite from the reach of the law. This has been accompanied by the emergence of "zones of illegality" in state conduct. These include repeated exposure of brutal police conduct and the alleged undermining of investigation of these by the Independent Police investigative Unit; an attempt to unconstitutionally extend term of office of the Chief Justice, the National Prosecution Authority (NPA) failure to comply with an order of the Supreme Court of Appeal to hand over information that informed its decision to drop charges against President Zuma; the Department of Education's failure to comply with a court order to deliver textbooks in Limpopo schools; illegal denial of rights of assembly and free movement, and many others. Simultaneously, institutions established in terms of Chapter Nine of the Constitution in order to defend our democracy are being marginalised or neutralised. Similarly, parliament's role in holding the Executive accountable has been drastically eroded since 1994. All of this represents a systematic closure of political space and erosion of our democratic gains. 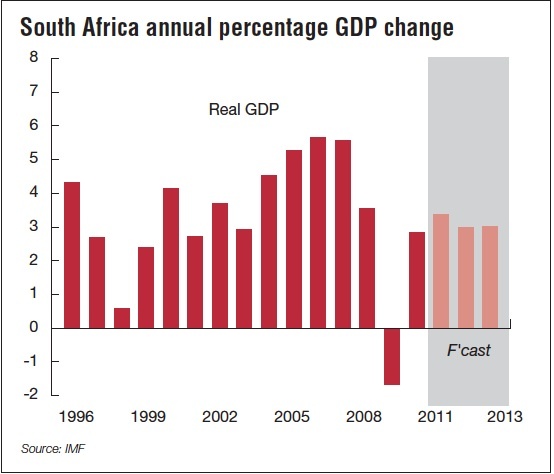 Notwithstanding its progressive policies, the ANC in government seems firmly on a conservative trajectory. This is evidenced by hesitant and unenthusiastic efforts to deal with the scourge of corruption, attempts to retreat to the secretive unaccountable governance of the apartheid era, a clampdown on civil liberties including media, assembly and expression, the introduction of the Traditional Courts Bill which seeks to disenfranchises women in rural areas and reverses their constitutional rights, the attacks on the independence of the judiciary and C9s, and the rise of police brutality on a scale reminiscent of the apartheid era. The politics of money are confounding our democracy as illicit beneficiaries of the new order are determined to bankroll it. Even the ANC leadership, in its acknowledgement of this problem, falls short of conceding that the organisation is captured by the dark forces of money. Although, the opposition leader in the Democratic Alliance has claimed a lot of the moral high ground abandoned by the ANC, the other opposition parties have been constrained by lack of resources, capacity and in some instances damaging internal divisions from doing the same; their cause notwithstanding. The leading trade union COSATU, which in very difficult conditions seemed to be the only remaining Alliance pillar holding on to the values of the liberation movement, is buckling under a systematic assault to toe the line, hence the internal divisions. The deep divisions in the National Union of Mineworkers (NUM) which have seen the emergence of alternative worker formations are a sign of things to come for the federation. We have now entered an era of unstoppable breakaway unions across sectors evidenced by about eight such unions formed in the recent period. These developments are likely to be accompanied by violence as the rhetoric of intolerance grows. With the hegemony of the ANC broken, a COSATU that is aligned to the former cannot avoid the contagion of a political meltdown. Incapable of quickly assuming an independent identity, it has left fertile ground for an alternative force to emerge. Simultaneously, a powerful civil society has emerged, capable of pushing the boundaries mounted by those seeking to close the political space. Although not aligned, this grouping has often been at the sharp end of the wrath of government and some leaders in the ANC and the South African Communist Party. Yet its voice resonates with many in the leadership of the Alliance, honest and courageous enough to acknowledge that they breath a desperately needed perspective on who we set about to be, as a society and a movement. It is these and many other moving parts that suggest that the momentum of the country's politics is no longer only determined by developments in the ANC, but importantly, by the outcome of the machinations outside of it. However, the outcome of the ANC conference which is held every five years to elect its leaders, planned in Mangaung for 16-20 December, will most probably impact on the pace and character of these developments. In this context, the postulation of the opposition Democratic Alliance as a realistic alternative is likely to prove premature. Under normal circumstances, these would be healthy signs of a democracy alive and robust. However, they have been accompanied by a growing language of intolerance which has often resulted in violence including within the ANC, inter-party and intra-party particularly in Kwa-Zulu Natal, among workers and elsewhere. Even the glorious liberation army's veterans group MKMVA is being reduced into a vigilante group operating parallel to government security forces; a frighteningly dangerous phenomenon for our democracy. All of these socio political developments have been compounded by the severe challenges that the economy is facing. 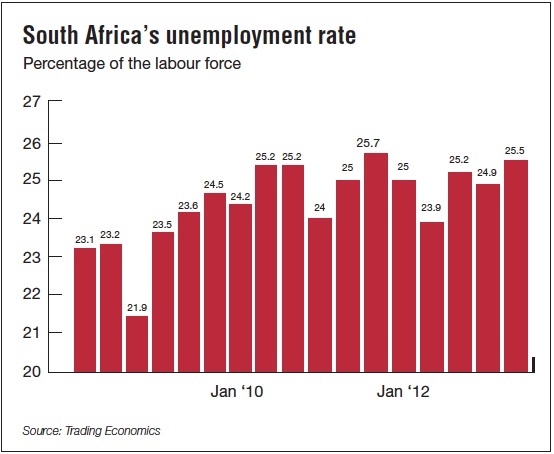 The biggest challenge is the labour market distortions that are reminiscent of the apartheid era. High unemployment of between 25% and 36%; a disturbingly high level of skills shortages that is accentuated by the failure of the education system; persistent workplace discrimination. All of these have resulted in low levels of productivity, widening income gap and inequalities and a large number that has to rely on social grants for survival. The low levels of growth since 2009 at about 2.2% on average against 6.5% required in order to meaningfully reduce unemployment. Growing imports that exceed exports resulting in a increasing balance of payment deficit. Together with the rise in social security spending, the budget deficit is growing with high prospects for a negative impact on the economy. With the increased cost of energy and transport, as a result of excessive demand for electricity and high oil prices, the growth of the economy is constrained. The infrastructure spending commitments may have to be funded with increased borrowing from the markets. In light of the sovereign risk downgrade which was followed by similar action against some state owned enterprises (SOEs) and some blue chip companies, the rate of borrowing is likely to be high and in the long run so difficult as to result in shelving of some of these projects. Ironically, these trying times require single-minded leadership across society, particularly in government. The established institutions of social dialogue such as National Economic Development Council (NEDLAC) have been sidelined, mainly by government. As a result the country is singing from different hymn-sheets. A nation aware of its desperate woes, seems incapable of generating the leadership it needs. This is not the South Africa of the early 1990s which in crisis had leadership to steer it from turbulence to sturdy waters. Yet, the great reservoir of goodwill, both international and domestic has been squandered. On your own, my beloved country, you have to navigate your way out of this crisis, lest we become a basket case. These are ominous signs for our young democracy. The greatest anxiety stems from two critical questions, will our institutions of democracy hold? Even more importantly, is it conceivable the forces of the "low dirt road" might suspend the constitution and install an absolute majoritarian rule for which they've been clamouring? Our country was able to survive the worst financial crisis to hit the world because of the resilience of our regulatory framework and institutions. The period 2007 saw us chip away at inequalities, eroding unemployment the economy experienced growth rates of over 4%. International confidence in our economy was at an all time high with sovereign credit ratings that enabled us to borrow money in international money markets at competitive rates. Our country was a favoured destination for foreign direct investments. This situation has changed dramatically in the short space of five years, partly as a result of the crisis in the world economy, but largely as a consequence of the country losing its way in the absence of credible leadership. The setbacks suffered in the recent period are not irreversible. Only a scrupulous, resolute and single-minded leadership backed by citizens determined to defend the gains of our hard earned freedom and democracy, would enable our great nation to reclaim its moral high ground. Remember, we owe our loyalty, less to leaders, people and even organisations, but to a cause which whenever it is betrayed, we have a civic duty to abandon our comfort zones and defend. How many South Africans could convincingly deny that that moment is unon us today? Sipho Pityana is a former Director General in Nelson Mandela's government, former trade unionist and ANC activist. He is now Chairperson of Council for the Advancement of the South African Constitution and a businessman (writing in his personal capacity).